DriDanube project’s aim is to increase the capacity of the Danube region to adapt to climatic variability by managing drought related risks. Currently, the drought management in the region is rather weak, dealing mostly with losses and damages and majority of countries in the Danube region have not included drought issues into legislation yet. Existing legal frameworks are addressing the challenge of water scarcity and droughts and the main policy instrument in drought management still remains the Water Framework Directive (WFD) and Climate Change Adaptation Strategies. One of the important concepts of the WFD is the organization and regulation of water management at the level of river basins where the central administrative tools are the River Basin Management Plans (RBMPs). 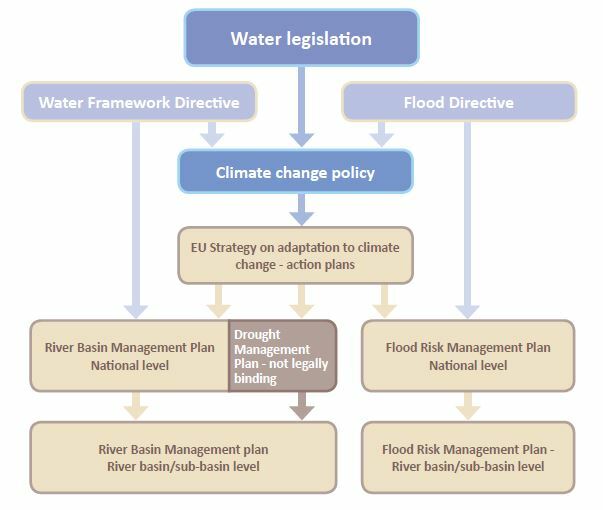 Photo: Integrated water management – planning process in the context of the Water Framework Directive (source: Guidelines for preparation of the Drought Management Plans). DriDanube project, by its aim to enhance the Danube region’s resilience to drought, is mainly contributing to the Priority area 5 (Environmental Risks), Action 4 “To strengthen operational cooperation among emergency response authorities in the Danube countries and to improve the interoperability of the available assets”. Common methodology for drought risk assessment will contribute to the harmonization of methods and tools for risk assessment and mapping (Milestone 1, Output 1). A special software for developing drought risk maps (comparable among countries) will add to the Output 2 (Milestone 1) where the main goal is “to develop best practices in the usage of GIS application for risk mapping of extreme-weather events”. Commonly set standards of drought risk mapping will be developed within DriDanube's Work Package 5 and will fit the Output 3 (Milestone 1). Milestone 2 wants to establish comparable data/information systems about extreme climatic events and DriDanube Drought User Service is fitting such purpose with its innovative tool for drought monitoring and management. It will contribute to a more accurate and efficient drought monitoring and early warning for the entire Danube region. It will include a set of Earth Observation data from a range of operational remote sensing satellites, which are processed into ready-to-use drought information, available to the general public with a web-browser interface. At the end, it will upgrade and connect with already established drought monitoring in the region and beyond (connection with European Drought Observatory). DriDanube is seeking synergies with other established programmes and frameworks, such as Integrated Drought Management Programme in CEE (IDMP CEE) and Drought Management Centre for Southeastern Europe (DMCSEE) to raise awareness about drought issues in the Danube region, communicate the knowledge gathered and exchange best practices. Therefore, it contributes to the Task 3, Milestone 3 – “Awareness raising and sharing the experiences on the involvement of the population into the preparations for disasters (especially flooding) and the practices of the recovery measures” and Action 12 of the PA4 – “Strengthening awareness and facilitating exchange of good practice in integrated water management issues.” The DriDanube participates in capitalization activities with other projects – JOINTISZA, Danube Sediment and CAMARO-D.
DriDanube activities and outputs are well aligned with the Priority Area 4 actions in particular with Target 1 “Achieve the management objectives set out in the Danube River Basin Management Plan”. DriDanube results will be fed into the 3rd Danube RBMP to be elaborated till 2021. And the same goes with the two sub-basins – Tisza and Sava. A cooperation with JOINTISZA project (as a result of DTP Capitalization process) was already established by working jointly on a pilot action in Hungary and Serbia. DriDanube’s main expected result is the improved drought management and better cooperation among different sectors impacted by droughts. Drought is no longer primarily associated only with the loss or reduction of agricultural production. Today the occurrence of drought is also connected with significant impacts in energy, transportation, tourism, biodiversity and other sectors which are important for the whole Danube region. Climate change models predict increase in temperatures, uneven distribution of rainfall and more extreme weather events. Therefore, DriDanube will contribute through closer cooperation among relevant institutions and sectors in the region and a strong political support, to a better prepared and more resilient Danube Region.